I really didn’t plan to go off and cross the three main islands of the Philippines. It just so happened that I got an invite for a Mindanao festival and my other travel plans for the month of June 2012 just seamlessly volted in together. In the end, I ventured from one of the northernmost province of Luzon, visited the heart of Visayas and landed on the upper lands of Mindanao. Everything-everything in sixteen awesome days without boarding a single airplane. I tried listing down my detailed expenses for this trip here but have to give up. It was just darn too long! Anyways, I’ll try and do separate itineraries for each provinces I visited during this trip in the near future for your reference. For now, I hope this summary suffices. 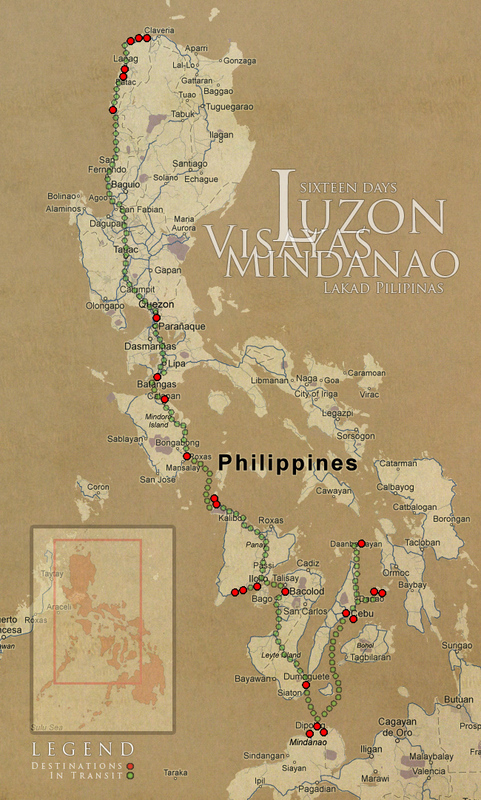 It took no less than sixty articles to cover the sixteen days I traversed Luzon, Visayas and Mindanao, whew! Hope you enjoyed my stories as much as I enjoyed the trip! round the pinas pala to! :P yaaaay ui Christian, san mo ni generate ung map chuva? Hehe gawa ka rin ng ganyan Ding! Great trip and great write-ups Christian! Nakakainggit! This is nothing short of awesome. Kudos, Christian! Your blog and your travels are a great inspiration. yeah, sometimes it is more fun to go with the flow of the changes that happen or the accidents that interrupt one's planned activities. it can make the journey even more interesting because everything tends to happen for a purpose. 16 days lang?! Ok sana kaso ubos kaagad leave ko nito.haha anyhoo gudjab! That's a great experience for you sir. I,too, wish to travel the Philippines from Luzon to Mindanao. I just don't know how. You're a lucky guy. But then again, I guess, my stomach would give in because too much traveling. Looking at the map, I guess you've never made it to Bataan. Oh well, just in case you'll end up being here and can't find a place to stay, there is this Fav Hotel, a great place for travelers to stay for a day of two or for as long as you want. I can't imagine how you managed to traveled like that in just 16 days.